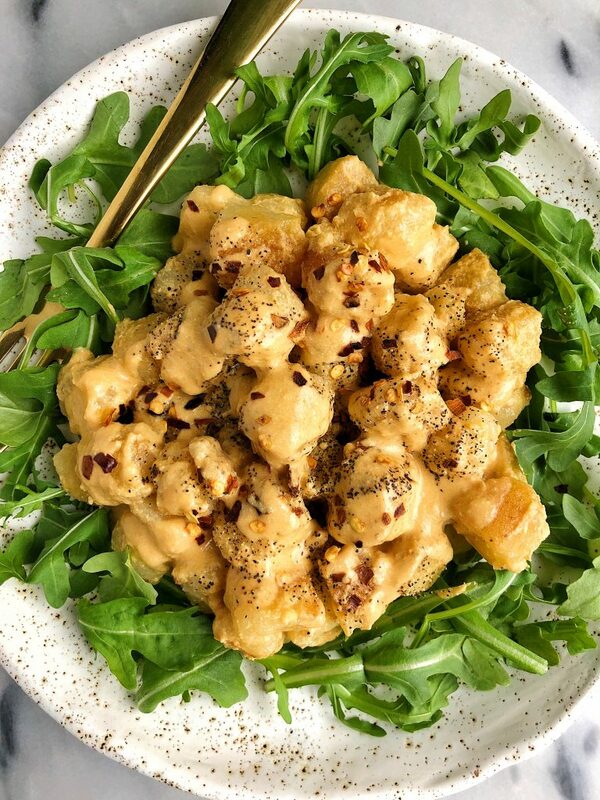 Crispy Cauliflower Gnocchi Mac and Cheese using Trader Joe’s Cauliflower Gnocchi and a dreamy vegan nut-free cheese sauce! 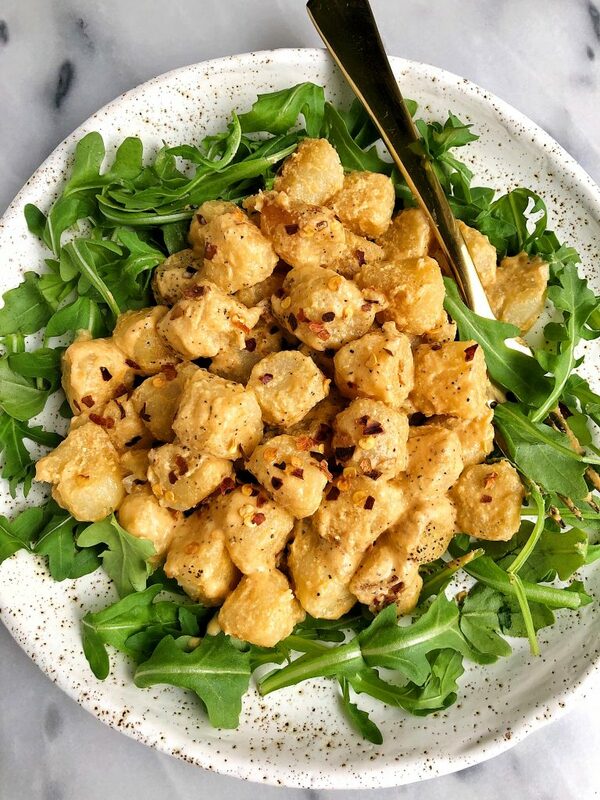 Why has it taken me this long to turn my cauliflower gnocchi obsession into a mac and cheese recipe?! I have shared oh so many mac and cheese recipes this year on the blog, but I am pretty sure the obsession just keeps on growing. Not sure if it is a pregnancy thing or what but making a healthier version of a classic that actually tastes good, is one of my favorites. 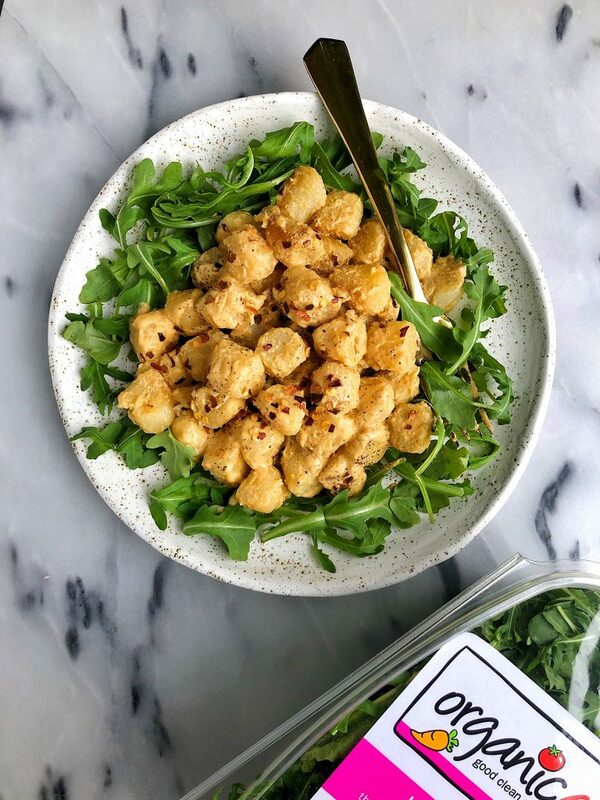 Especially after finally trying the Trader Joe’s Cauliflower Gnocchi back in the fall and using that as a base for a lot of my pasta recipes. But how does one cook the cauliflower gnocchi? We all know and have heard not to cook it according to the package instructions and there are about 100 different ways on Instagram people talk about daily. I personally don’t do anything too fancy as you’ll see and I’m also likely not the first person to make it this way. I love to just crispy the gnocchi in some avocado oil or grass-fed butter for a few minutes and let it get all crispy and cooked. I don’t microwave it or add water or anything fancy. Those methods probably taste great as well, but I have found this minimal way to work very well over here. Let’s get to this new dish though. Crispy Cauliflower Gnocchi Mac and Cheese plus all the organic leafy greens. Call me weird but I don’t like eating a savory meal like this without some veggies involved and usually some extra protein too. I love adding some grass-fed meatballs or sausage to this dish but the base of it and cheese-less cheese sauce is all vegan. I always add some Organic Girl greens for the extra crunch and nutrients. I’m not someone who eats salad or smoothies a lot so I try to sneak in my greens as much as I can. Organic Girl’s baby arugula is my go-to for the subtle bitterness of the green and it pairs deliciously well with this mac and cheese! *Leftovers will keep in the fridge for about 5 days but this tastes best day of in my opinion! ***I love adding in grass-fed meatballs or any protein of choice as well to make this a bit more filling! Thank you Organic Girl for sponsoring this post! I love that cauliflower gnocchi and I’m going to have to try that cheesy sauce! Is there any other way to get that cheese flavor without nutritional yeast? Unfortunately I can’t have it. When you say scoop out the cream from the can of coconut milk, is that what you is in the recipe or the liquid? Or both? Oh my gosh, this is one of the best things I have ever made and it was so easy! The sauce was so thick and creamy – it actually smelled and tasted like the Annie’s Vegan Mac and Cheese sauce from the boxed mac and cheese, but it was 10x better! I added broccoli and peas in with the cauli gnocchi and sauce and it was amazing. My roommate even said “that smells cheesy!” before she knew what I eating! So, so good, thank you so much for sharing this recipe!